Have you ever wondered what exactly goes on inside a playwright's head? Like, where exactly did that idea come from? Never have I been more curious as to the origin of ideas than after seeing the series of short plays that comprise Troy Deutsch's In a Tilted Place. The nine plays that make up In a Titled Place start out, well, normal, and then take a drastic turn. 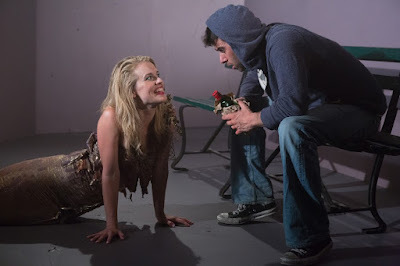 Co-directed by Ashley Brooke Monroe and Courtney Ulrich, In a Tilted Place showcases the dark whimsical world of Troy Deutsch and his poetic tongue. Hidden deep within each piece was a message, but it may take a couple more passes through to truly grasp them. Though the through line may be hard to find, each piece included at least one damaged or broken character. From a privileged princess on the verge of a breakdown to two women battling a physical change to an emotionally abused boyfriend to a girl with roomie issues, their personal woes are what bring the humanity into the pieces. As absurd as they may be, In a Titled Place brings on the shock. But where do they all come from? Well, that's a bigger question. There are slight common themes that connect the various worlds. And some of them, intentionally or not, borrow a character from a previous play. Stylistically they range from something out of the sketch world to stream of consciousness monologues. But do they all work congruent with one another? It's a bit of a stretch. The show cycle format should bring the audience on a journey, and while each play has its own arc, the overlying arc of the evening, from number one to number nine, should be clear. And with a thin through line, this arc seemed a tad blurry. Looking at the plays individually, the strongest piece happened to be the one where you laughed at the comedy and not out of discomfort. “Brown Fish” featured a girl at her wits end, played energetically and truly by comedic genius Rachel Moulton, who tells her friend about her whacky roommate who has been crafting a "poop cabin" in her bedroom. The scene is out there. The situation is bizarre, but despite the oddity of the story, it somehow works. And you're engaged from start to finish thanks to the "Chekov's Gun" device of a wrapped present casually sitting on the edge of the bench. The other strong scene was “The Rockefeller Center Play” in which a lunatic businesswoman berates her loving boyfriend in the middle of Rockefeller Center. In both pieces, Deutsch showcases his poetic style via accessible dialogue. Those are the moments when he shines brightest. In a show cycle, the ensemble of actors are granted the opportunity to take on an assortment of roles. The utility player of the cast was Michael Kingsbaker. Kingsbaker went seamlessly from psychotic squirrel mascot to down and out junkie to nerdy dinner with ease. It's always a good sign when you have to check the program to see if it was a different actor. The other strong player was Pamela Shaw who, despite being placed in some of the odder pieces, was a natural. The language came easy to Shaw who was beyond persuasive in each scene. Like Kingsbaker and Shaw, Ronald Peet found his moments. He had great potential and is one to look out for. Kelsie Jepsen seemed to be the one to struggle most with this style of theater. Jepsen brought high-octane drama and a shrill tone that never changed. Without change, her characters, one of which may be the most intriguing, suffered. To realize Deutsch’s plays, directors Ashley Brooke Monroe and Courtney Ulrich tag-teamed the night. They took the mixed-bag of plays and brought out the absurd. Using Kate Noll’s very interesting and mysterious set, the space transformed from location to location. The set was basic with light-colored and slightly textured walls, allowing Scot Gianelli’s lights to add a different atmosphere to each. One of the most interesting aspects of the Noll’s design was the circular proscenium. It allowed you to look into this crazy world through a lens but it’s unfortunate that the execution of the piece was a bit messy, something you couldn’t avoid looking at. Additionally, the final moment of the evening featured a grand reveal, fog and greens and all. Due to the unfortunate site lines of IRT, the moment was lost to some, begging the question, was it worth it? In a Tilted Place is not for everyone. It's a very specific style of work. Be prepared for theater that’s not quite the norm. But that’s what makes it unique.